I am new to A New Design by Ashley Cannon Newell, but I really like what I see. I was moved by the card you see below. 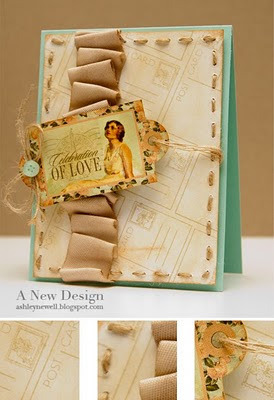 I love the tone on tone palette and the unexpected use of Tiffany blue for the card base. But my favorite design element is the soft ribbon. I love how Ashley riffs on the popular ribbon pleating and creates a fresher, softer look. This card is not "jazzy", it is jazz.